If you like this blog, definitely, you will also love my other blog sites too! Aside from this personal and celebrity blog, I also have other blog sites covering entertainment, fitness, running, lifestyle, trends, fashion, foods, magazine covers, TV series, movies, music, music videos, lyrics, arts, photography, tech, gadgets, and gizmos. These genres give rise to my six active blog sites serving all your internet needs. I'm updating and maintaining them all frequently. Just click on their logos above and you will automatically prompted to the said websites! 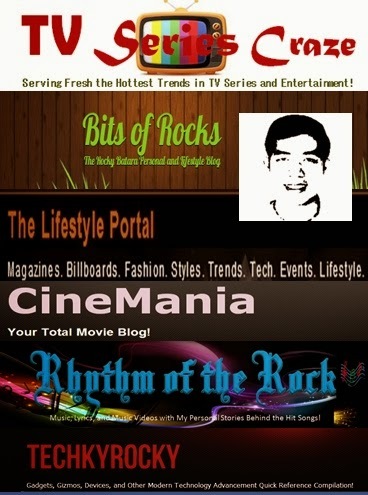 These blogs comprise the so-called, "The Rock's Blog Network!" Yes, this is like a league of all my blogs! So what are you waiting for, visit them now and feel the difference! Aside from these blog sites, you can also reach me in my other social media like Twitter and Instagram. Of course, if you want to contact me or send me invites to your upcoming events or coverage, feel free to email me at: rockenroll_04@yahoo.com.